“More success” is what celebrity chef Tobias Dorzon said he found when he left the game of football to spend more time with his family. For the 34-year-old father of two, there isn’t a single thing he misses about being a professional athlete. He’d discovered his inherent passion for cooking after a short career in the NFL and solid time in the Canadian Football League. “I went to culinary school in one of my offseasons in late 2012 and figured out that I can have the same success at home,” Dorzon said. So he set out on a journey that saw him evolve from an athlete and family man with an innate cooking ability into an executive chef with a star-studded list of celebrity clients, a food truck and even some time as a restaurant co-owner. Dorzon’s first client, then-Washington Redskins wide receiver Santana Moss, took a chance on him after seeing his food posts on Instagram. After Dorzon launched Victory Chefs in 2014, his business quickly grew. Raised just outside of Washington, D.C., in Riverdale Park, Maryland, Dorzon returned to the area after leaving football, and access to athletes was easy enough. After one of his food deliveries to Moss, other players in the Redskins’ locker room wanted in. As he took on more NFL clients and word of mouth spread, Dorzon began cooking for several other NFL and NBA players, including DeSean Jackson, Trent Williams, Jameer Nelson, Jeff Green and Jarrett Jack, and even a few entertainers, like Chris Brown, Snoop Dogg and The Game. Dorzon then opened a successful food truck, and as his popularity continued to soar, so did other interests in his talent. In 2018, he was asked to be part owner and lead chef of a new D.C. restaurant, Union Oyster Bar & Lounge, but he parted ways with the establishment soon after opening. Dorzon says his exit was not bad. Dorzon, whose given first name is Bloi-Dei, started playing high school football before graduating in 2003. After he decided to forgo college, a life-changing event pushed him to set new life goals. “I had my oldest daughter when I was 21, and that inspired me to go back to school,” Dorzon said. He started out at a junior college in Pennsylvania before attending Jackson State University in Mississippi. His NFL journey began with a brief stint with the Tennessee Titans before he headed to the Tampa Bay Buccaneers for one year and then the Winnipeg Blue Bombers in Canada for two years. “In the CFL, I started enjoying football again because I played a lot more, but while in Canada I became really homesick, missing my daughter Riley,” he said. 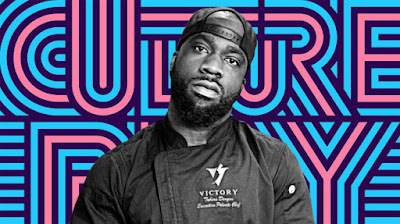 Dorzon’s second career follows in the footsteps of his father, who owned a West African-styled restaurant, Kendejah, that was located in the heart of Washington D.C.
For Dorzon, cooking remained in his heart and came naturally. He was born the youngest of nine siblings to Liberian parents. His oldest sister, Kendejah, whom the restaurant was named for when she was small, was tragically murdered in 2004. With his family dynamic in mind, he figured cooking would eventually become a mainstay in his life.